Bösendorfer, 1845, Vienna. Ignaz Bösendorfer began his career as apprentice to the piano builder Brodmann, later becoming shop foreman, and eventually taking over the firm around 1828, when Brodmann retired. (The company still makes pianos in Vienna as a part of the American-owned Kimball International.) The present instrument, typical of mid-nineteenth-century pianos, is parallel-strung, with a range of CC - a4. Liszt used similar pianos in Vienna in 1846. 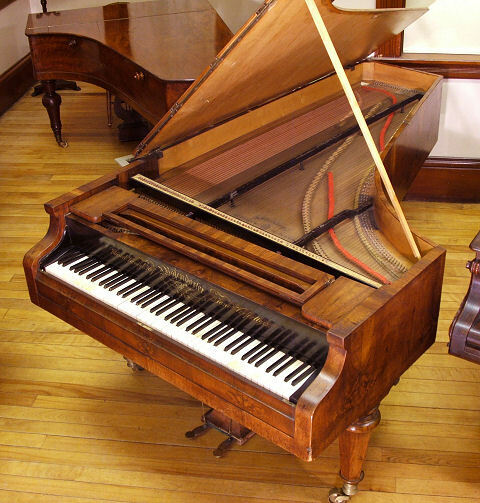 This piano and the 1846 Streicher piano, both by leading makers, and similar in appearance, are noticeably different in sound. Visitors to the collection tend to be equally divided in their preference for one or the other, just as, one would imagine, were people in Vienna in the 1840s. Pianos such as these were played in concert by Franz Liszt and Clara Schumann.